Apaprently, Paula Deen's claims that she invented the donut burger are not entirely true. Her son, Jaime Deen set things straight by telling the world the real story -- his mom based the recipe off something they saw in Minor League Baseball. "You know what's funny is that's not her recipe. That was a Minor League Baseball thing, and my mom did like a spoof on it. That's the only thing that really bothered me was they gave us credit for that recipe but it wasn't even our recipe," Jamie told the Daily Meal. "The Minor League Baseball team did one of those things, you make the craziest things you can think of. 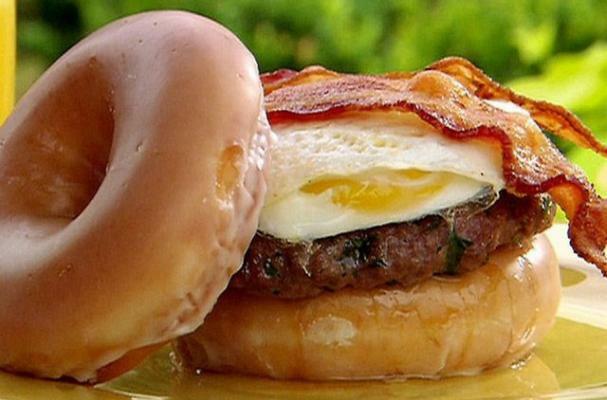 So they made a cheeseburger on a donut. And it was on the nautical news cycle for about five months and somebody from our production team put it together. I have never tasted or seen my mom ever make a Krispy Kreme cheeseburger in my life." The original donut burger was called the Grizzlie Burger and was served at an Illinois stadium in 2006, two years before Deen used donuts as hamburger buns on her television show, Paula's Home Cooking.